In 1999, Charles Moore discovered a sea of plastic, the size of the state of Texas, collecting in the North Pacific gyre. 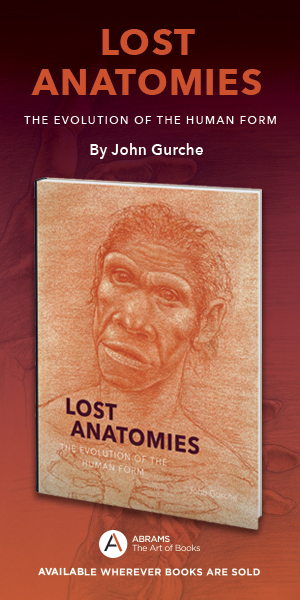 His account of the find, below, first appeared in the November 2003 issue of Natural History. Commemorating the 15th Anniversary of that first expedition, Captain Moore and crew will once again venture to the area referred to as "The Great Pacific Garbage Patch." July 1 - August 15, 2014, the crew will live in the center of this plastic world to determine the extent to which this new habitat mimics an inherently toxic coastline. You can follow the expedition @ http://www.algalita.org/2014NorthPacificGyreExpedition.html. It was on our way home, after finishing the Los Angeles-to-Hawaii sail race known as the Transpac, that my crew and I first caught sight of the trash, floating in one of the most remote regions of all the oceans. I had entered my cutterrigged research vessel, Alguita, an aluminum-hulled catamaran, in the race to test a new mast. Although Alguita was built for research trawling, she was also a smart sailor, and she fit into the "cruising class" of boats that regularly enter the race. We did well, hitting a top speed of twenty knots under sail and winning a trophy for finishing in third place. 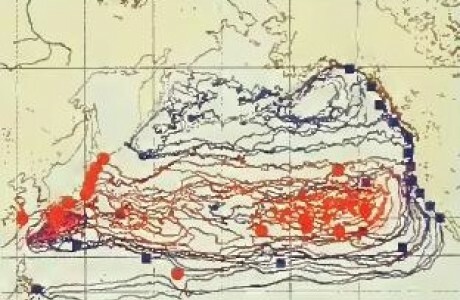 Throughout the race our strategy, like that of every other boat in the race, had been mainly to avoid the North Pacific subtropical gyre—the great high-pressure system in the central Pacific Ocean that, most of the time, is centered just north of the racecourse and halfway between Hawaii and the mainland. But after our success with the race we were feeling mellow and unhurried, and our vessel was equipped with auxiliary twin diesels and carried an extra supply of fuel. So on the way back to our home port in Long Beach, California, we decided to take a shortcut through the gyre, which few seafarers ever cross. Fishermen shun it because its waters lack the nutrients to support an abundant catch. Sailors dodge it because it lacks the wind to propel their sailboats. I often struggle to find words that will communicate the vastness of the Pacific Ocean to people who have never been to sea. Day after day, Alguita was the only vehicle on a highway without landmarks, stretching from horizon to horizon. Yet as I gazed from the deck at the surface of what ought to have been a pristine ocean, I was confronted, as far as the eye could see, with the sight of plastic. It seemed unbelievable, but I never found a clear spot. In the week it took to cross the subtropical high, no matter what time of day I looked, plastic debris was floating everywhere: bottles, bottle caps, wrappers, fragments. Months later, after I discussed what I had seen with the oceanographer Curtis Ebbesmeyer, perhaps the world's leading expert on flotsam, he began referring to the area as the "eastern garbage patch." But "patch" doesn't begin to convey the reality. Ebbesmeyer has estimated that the area, nearly covered with floating plastic debris, is roughly the size of Texas. My interest in marine debris did not begin with my crossing of the North Pacific subtropical gyre. Voyaging in the Pacific has been part of my life since earliest childhood. In fifty-odd years as a deckhand, stock tender, able seaman, and now captain, I became increasingly alarmed by the growth in plastic debris I was seeing. But the floating plastics in the gyre galvanized my interest. I did a quick calculation, estimating the debris at half a pound for every hundred square meters of sea surface. Multiplied by the circular area defined by our roughly thousand-mile course through the gyre, the weight of the debris was about 3 million tons, comparable to a year's deposition at Puente Hills, Los Angeles's largest landfill. I resolved to return someday to test my alarming estimate. Historically, the kind of drastic accumulation I encountered is a brand-new kind of despoilment. Trash has always been tossed into the seas, but it has been broken down in a fairly short time into carbon dioxide and water by marine microorganisms. Now, however, in the quest for lightweight but durable means of storing goods, we have created a class of products—plastics—that defeat even the most creative and voracious bacteria. Unlike many discarded materials, most plastics in common use do not biodegrade. Instead they "photodegrade," a process whereby sunlight breaks them into progressively smaller pieces, all ot which are still plastic polymers. In fact, the degradation eventually yields individual molecules of plastic, but these are still too tough for most anything—even such indiscriminate consumers as bacteria—to digest. And for the past fifty years or so, plastics that have made their way into the Pacific Ocean have been fragmenting and accumulating as a kind of swirling sewer in the North Pacific subtropical gyre. Ocean Surface Current Simulator (OSCURS) model developed by W. James Ingraham Jr., an oceanographer at the National Oceanic and Atmospheric Administration (NOAA), predicts the trajectory of drift originating along the coasts of the North Pacific rim. Drift from Japan is shown in red; drift from the United States, in blue. The diagrams show the position of drift after 183 days (top), three years (center), and ten years (bottom). It surprised me that the debris problem in the gyre had not already been looked at more closely by the scientific community. In fact, only recently starting in the early 1990s—has the scientific community begun to focus attention on the trash in the gyre. One of the first investigators to study the problem was W.James Ingraham, Jr., an oceanographer at the National Oceanic and Atmospheric Administration (NOAA) in Seattle. Ingraham's Ocean Surface Current Simulator (OSCURS) predicts that objects reaching this area might revolve around in it for sixteen years or more. an article on the debris they had collected in fish trawls of the Southern California Bight, a region along the Pacific coast extending a hundred miles both north and south of Los Angeles. As I discussed the design plan for our survey with Weisberg's statisticians, Molly K. Leecaster and Shelly L. Moore, it became apparent that we were facing a new problem. In the coastal ocean, bodies of water are naturally defined, in part, by the coasts they lie against. In the open ocean, however, bodies ot water are bounded by atmospheric pressure systems and the currents those systems create. In other words, air, not land, defines the body of water. Because air pressure systems move, the body of water we wanted to survey would be moving as well. 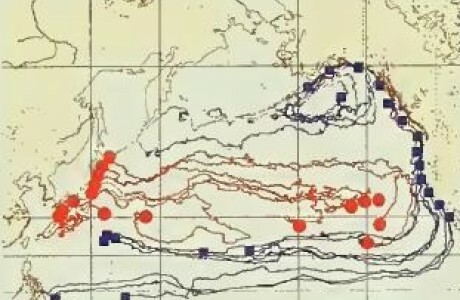 A random sample of a moving area such as the gyre would have to be done quite differently from the way Weisberg's group had conducted their survey along the Pacific coast. The gyre we planned to survey is one of the largest ocean realms on Earth, and one of five major subtropical gyres on the planet. Each subtropical gyre is created by mountainous flows ot air moving from the tropics toward the polar regions. The air in the North Pacific subtropical gyre is heated at the equator and rises high into the atmosphere because of its buoyancy in cooler, surrounding air masses. The rotation of the Earth on its axis moves the heated air mass westward as it rises, then eastward once it cools and descends at around 30 degrees north latitude, creating a huge, clockwise-rotating mass of air. 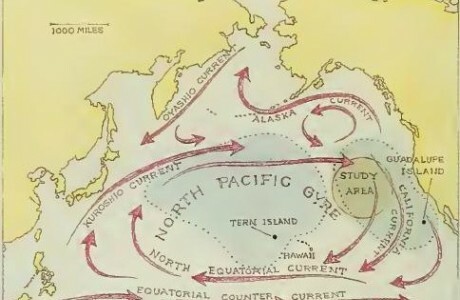 Currents in the North Pacific move in a clockwise spiral, or gyre, which tends to trap debris originating from sources along the North Pacific rim. Plastics and other waste have accumulated in the region, which includes the foraging areas of Pacific bird colonies, such as that of the Tern Island albatross, shown in blue, and that of the Guadalupe Island albatross, shown in green. The rotating air mass creates a high-pressure system throughout the region. Those high pressures depress the ocean surface, and the rotating air mass also drives a slow but oceanic-scale surface current that moves with the air in a clockwise spiral. Winds near the center of the high are light or even cahn, and so they do not mix the floating debris into the water column. This huge region, what I call a "gentle maelstrom," has become an accumulator ot debris from innumerable sources along the North Pacific rim, as well as from ships at sea. The subtropical gyres are also oceanic deserts—in fact, many of the world's land-based deserts are at nearly the same latitudes as the oceanic gyres. Like their terrestrial counterparts, the oceanic deserts are low in biomass. On land the low biomass is caused by the lack of moisture; in oceanic deserts the low biomass is a consequence of great ocean depths. In coastal areas and shallow seas, winds and waves constandy stir up and recycle nutrients, increasing the biomass of the food web. In the deep oceans, though, such forces have no effect; the bottom sequesters the nutrient-rich residue of millions of years of near-surface photosynthetic production, as well as the decomposed fragments of life in the sea, trapping them miles below the surface. Hence the major source of food for the web of life in deep ocean areas is photosynthesis. But even in the clear waters that prevail in the subtropical gyres, photosynthesis is confined to the top of the water column. Sunlight attenuates rapidly with depth, and by the time it has gone only about 5 percent of the way to the bottom, the light is too weak to fuel marine plants. The net effect is a vast area poor in resources, an effect that makes itself felt throughout the food web. Top predators such as tuna and other commercially viable fish don't hang out in the gyres because the density of prey is so low. The human predator stays away too: the resources that have drawn entrepreneurs and scientists alike to various regions of the ocean are not present in the subtropical gyres. Filter-feeding chordate jellyfishes known as "salps" dominate the North Pacific subtropical gyre. 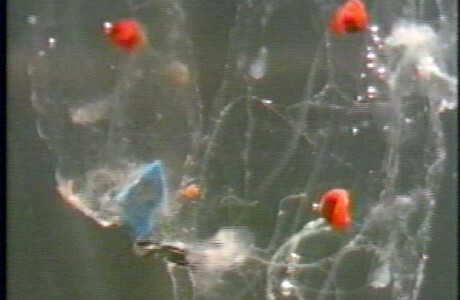 Investigators aboard the research vesse/ Alguita observed salps in the gyre, such as the one shown here, with brightly colored plastic fragments in their bellies. What does exist in the gyres is a great variety of filter-feeding organisms that prey on the ever-renewed crop of tiny plants, or phytoplankton. Each day the phytoplankton grow in the sunlit part of the water, and each night they are consumed by the filter feeders, a fantastic array of alien-looking animals called zooplankton. The zooplankton include chordate jellyfishes known as "salps," which are among the fastest-growing multicellular organisms on the planet. By fashioning their bodies into pulsating tubes, the salps are able, each day, to filter half the water column they inhabit, drawing out the phytoplankton and smaller zooplankton for food. But salps are gelatinous creatures with a low biomass, and so there is no market for them, either. Hence the realm they dominate, one of the largest uniform habitats on the planet, remains unexploited and largely unexplored. Leecaster, Moore, and I came up with a plan to make a series of trawls with a surface plankton net, along paths within a circle with a 564-mile radius. The area of the circle would then be almost exactly 1 million square miles. Trawling would start when we estimated we were under the central pressure cell of the high-pressure system that creates the gyre. We would regard the starting point as the easternmost point along the circumference of the circle. Then we would proceed due west to the center of the circle, turn south, and sail back to the southernmost point on the circumference, alternating between trawling and cruising. We intended to obtain transect samples with random lengths and random spacing between trawls. To be conservative about our sampling technique, we decided that any debris we collected would count only as a sample of the debris within the area of the transected circle. In August 1998, I set out with a four-member volunteer crew from Point Conception,California heading northwest toward the subtropical gyre. Onboard Alguita was a manta trawl, an apparatus resembling a manta ray with wings and a broad mouth, which skimmed the ocean surface trailing a net with a fine mesh. Eight days out of port, the wind dropped below ten knots and we decided to practice our manta trawling technique, taking a sample at the edge of the subtropical gyre, about 800 miles offshore. We pulled in the manta after trawling three and a half miles. What we saw amazed us. We were looking at a rich broth of minute sea creatures mixed with hundreds of colored plastic fragments—a plastic-plankton soup. The easy pickings energized all of us, and soon we began sampling in earnest. Because plankton move up and down in the water column each day, we needed to trawl nonstop, day and night, to get representative samples. When we encountered the light winds typical of the subtropical gyre. we deployed the manta outside the port wake, along with two other kinds of nets. Each net caught plenty of debris, but far and away the most productive trawl was the manta. • a menacing medusa of tangled net lines and hawsers that we hung from the A-frame of our catamaran and named Polly P, for the polypropylene lines that made up its bulk. In 2001, in the Marine Pollution Bulletin, we published the results of our survey and the analysis we had made of the debris, reporting, among other things, that there are six pounds of plastic floating in the North Pacific subtropical gyre for every pound of naturally occurring zooplankton. Our readers were as shocked as we were when we saw the yield of our first trawl. Since then we have returned to the area twice to continue documenting the phenomenon. During the latest trip, in the summer of 2002, our photographers captured underwater images of jellyfish hopelessly entangled in frayed lines, and transparent filter feeding organisms with colored plastic fragments in their bellies. Entanglement and indigestion, however, are not the worst problems caused by the ubiquitous plastic pollution. Hideshige Takada, an environmental geochemist at Tokyo University; and his colleagues have discovered that floating plastic fragments accumulate hydrophobic—that is, nonwater-soluble—toxic chemicals. Plastic polymers, it turns out, are sponges for DDT, PCBs, and other oily pollutants. The Japanese investigators found that plastic resin pellets concentrate such poisons to levels as high as a million times their concentrations in the water as free-floating substances. The potential scope of the problem is staggering. Every year some 5.5 quadrillion (5.5x10'") plastic pellets—about 250 billion pounds of them—are produced worldwide for use in the manufacture of plastic products. When those pellets or products degrade, break into fragments, and disperse, the pieces may also become concentrators and transporters of toxic chemicals in the marine environment. Thus an astronomical number of vectors for some of the most toxic pollutants known are being released into an ecosystem dominated by the most efficient natural vacuum cleaners nature ever invented: the jellies and salps living in the ocean. After those organisms ingest the toxins, they are eaten in turn by fish, and so the poisons pass into the food web that leads, in some cases, to human beings. Farmers can grow pesticide-free organic produce, but can nature still produce a pollutant-free organic fish? After what I have seen firsthand in the Pacific, I have my doubts. Laysan albatross is a species that forages througliout the North Pacific. 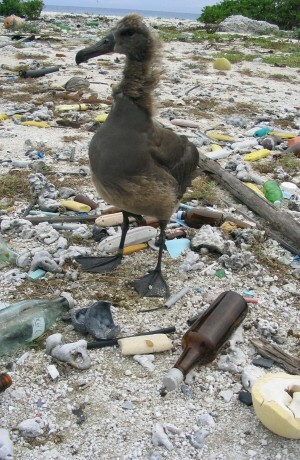 The regurgitated stomach contents, or boluses, of many such birds contain plastic debris. 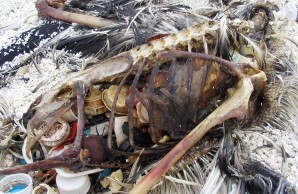 Many people have seen photographs of seals trapped in nets or choked by plastic sixpack rings, or sea turtles feeding on plastic shopping bags, but the poster child for the consumption of pelagic plastic debris has to be the Laysan albatross. The plastic gadgets one typically finds in the stomach of the bird—whose range encompasses the remote, virtually uninhabited region around the northwest Hawaiian Islands—could stock the checkout counter at a convenience store. My analysis of the stomach contents of birds from two colonies of Laysan albatrosses that nest and feed in divergent areas of the North Pacific show differences in the types of plastic they eat. I believe those differences reveal something about the way plastic is transported and breaks down in the ocean. On Midway Island in the Hawaiian chain, a bolus, or mass of chewed food, coughed up by one bird included many identifiable objects. By contrast, a bird on Guadalupe Island, which was 150 miles off the coast of Baja California, produced a bolus containing only plastic fragments. The principal natural prey of both bird colonies is squid, but as the ecologist Carl Safma notes in his book Eye of the Albatross, the birds' foraging style can be described as "better full than fussy." Robert W. Henry III, a biologist at the University of Cahfornia, Santa Cruz, and his colleagues have tracked both the Hawaiian and the Guadalupe populations of birds and found that the foraging areas of each colony in the Pacific are generally nonoverlapping and wide apart. One difference between the two areas is apparently the way debris flows into them. In Ingraham's OSCURS model, debris from the coast of Japan reaches the foraging area of the Hawaiian birds within a year. 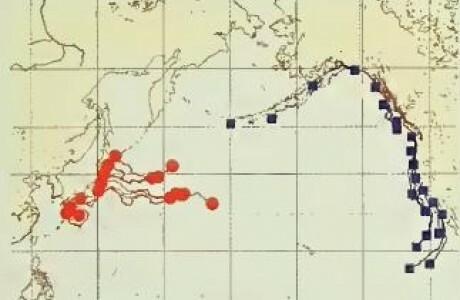 Debris from the West Coast ot the United States, however, sticks close to the coast until it bypasses the foraging area of the Guadalupe birds, then heads westward to Asia, not to return for six years or more. The lengthy passage seems to give the plastic debris time to break into fragments. The subtropical gyres of the world are part of the deep ocean realm, whose ability to absorb, hide, and recycle refuse has long been seen as limitless. That ecologically sound image, however, was born in an era devoid of petroleum-based plastic polymers. Yet the many benefits of modern society's productivity have made nearly all of us hopelessly, and to a large degree rationally, addicted to plastic. Many, if not most, of the products we use daily contain or are contained by plastic. Plastic wraps, packaging, and even clothing defeat air and moisture and so defeat bacterial and oxidative decay. Plastic is ubiquitous precisely because it is so good at preventing nature from robbing us of our hard-earned goods through incessant decay. But the plastic polymers commonly used in consumer products, even as single molecules of plastic, are indigestible by any known organism. Even those single molecules must be further degraded by sunlight or slow oxidative breakdown before their constituents can be recycled into the building blocks of life. There is no data on how long such recycling takes in the ocean—some ecologists have made estimates of 500 years or more. Even more ominously, no one knows the ultimate consequences of the worldwide dispersion of plastic fragments that can concentrate the toxic chemicals already present in the world's oceans. Ironically, the debris is re-entering the oceans whence it came; the ancient plankton that once floated on Earth's primordial sea gave rise to the petroleum now being transformed into plastic polymers. That exhumed life, our "civilized plankton," is, in effect, competing with its natural counterparts, as well as with those life-forms that directly or indirectly feed on them.